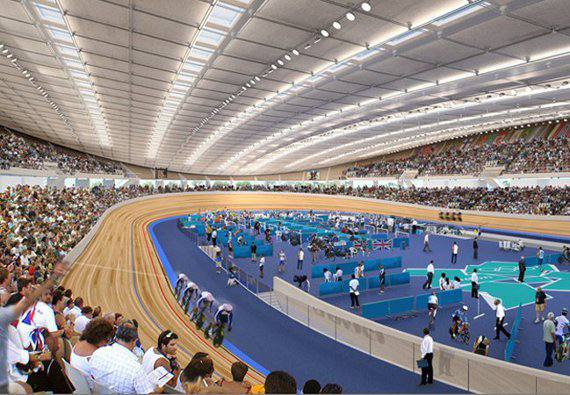 The first venue to be handed over to the Olympic Delivery Authority, eighteen months ahead of the start of the games, is the 2012 Olympic Velodrome. Designed by Hopkins Architects, the structure is one of four permanent venues in the Olympic Park. It seats 6,000 and features a two seating tiers split by the main public circulation concourse, which functions as the main point of entry into the building and allows spectators to view the track as they circulate. The facility’s overall design is inspired by the ergonomic qualities of a bicycle, with integrated sustainable elements providing an eco-friendly dimension.